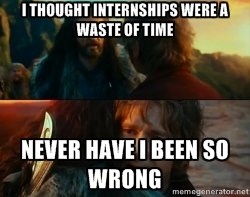 Internships. I have always hated it. I have always thought that internships are excuses for company to hire cheap labour and all you get to do is to pour coffee and photocopy papers. I didn't think that they were useful and that you could gain better experience elsewhere. I disliked it so much that it was enough for me to write a blog post about it: Why I Did Not Apply For An Internship. The past few weeks have been an eye opener to me ever since I started my permanent job as a psychologist associate at a child early intervention center. I loved every part of my job, from the chance of acting like a big kid during work to applying what I have studied into work, but a part of me cannot help but feel regret over the fact that I'm too ill equipped, or at least not as experienced as my colleagues, in performing my duties. I'm essentially starting fresh with 0 practical experience and somehow I wished that I had the opportunity to work here before during my days in uni. To have a better picture of how my course of study is applied in the real world. You see, in the past I had this perception that people merely took up internships for the sake of taking it. To make their resume prettier. Or because everyone else is doing it. A lot of my friends did it. And they end up complaining about their job day in and day out. Which was why I never thought internships were useful except to waste your time earning 800 bucks per month. I was wrong. No one ever told me that when you're taking internships, the best internships to take are the ones that you're planning to work in after graduation. In psychology for example, if I had known that a position such as psychology associate existed in voluntary welfare organizations and in the social work setting, I would have at least applied for internship in one of these organization. I realized that working in such a setting would have indirectly helped me in my studies as I am now finding myself actually regretting not paying enough attention in class and learning more. But alas, what passed has passed so here's an advise to all of you undergraduates out there that I wished I've had when I was studying myself, especially to the psychology majors. 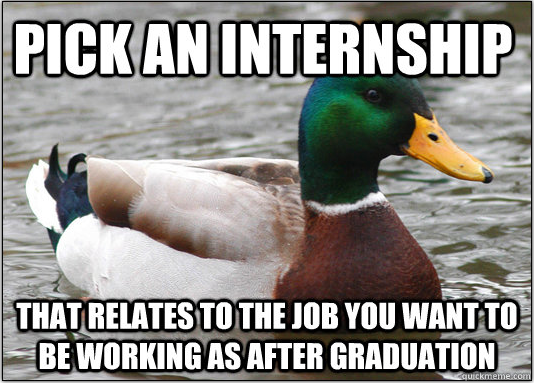 Pick an internship in an industry in which you want to work in after graduation. If you have always wanted to be a writer, apply for an internship in any publishing companies. If you want to work in a psychology setting like me, apply for any volunteer welfare organizations. It doesn't matter which organization you apply to, whether they're big o small, but as long as the job scope corresponds to what you plan to work as after your graduation it's more than enough. The reason's simple. Interning at a place that you're planning to work at, your dream job so to say, gives you a rough idea of what to expect after graduation. University life has always been the place where you find your passion and internship helps you to narrow it down. Internships give you a better picture of what your dream job looks like in a real life setting and experiencing it gives you an idea of how it feels working day in and day out for it. If you like what you're seeing, great, you could use your remaining university time to build towards that path but if it turns out that it's not what you have expected and hated it, that's great too. You can start planning for another job and it's better to know now than after you have started working permanently. My only problem was that I did not know that a position such as psychology associate exists and neither do I know how the social work atmosphere looked like in Singapore. So it pays to start looking into your after graduation life once you hit year 2 or 3 to get a rough direction of where you want to go. I was lucky in a sense, to have landed this job at my first try (which is why I always believe that there's a big hand from the sky always pushing me in the right direction) but I had started early, I'm sure what I'm having now would have been slightly better. So there you go. A piece of advice that I wished I knew when I was still studying.